It has been a difficult season for Manchester United fans. Indeed, it is difficult to transition from counting by how many points you are leading in the league to counting how many points you are off the top four. Never finishing lower than 3rd in the league in recent years, sitting at lowly 7th is no doubt a bitter pill to swallow. What went wrong at Old Trafford to condemn the 13-time Premier League champions to their current predicament? 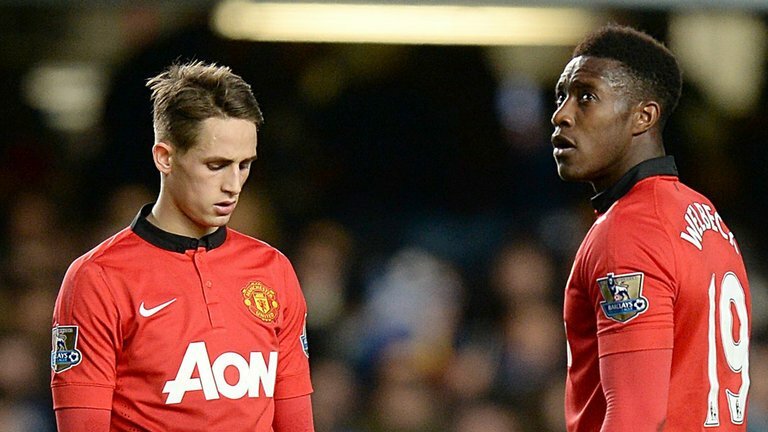 Failure to replace star players: When Cristiano Ronaldo left Old Trafford, he was replaced by Antonio Valencia. Granted, Valencia did play really well for United in his first two seasons but by no means was he a long-term replacement for Ronaldo and nor was he a player anywhere near Ronaldo’s calibre. When stars leave, they have to be replaced by other stars. The same goes for aging star players. The club brought in players to replace aging starts like Giggs, Scholes and Rio Ferdinand but they weren’t the world-class replacements that were needed. Thus, mediocrity found its way into the Manchester United team with the likes of Tom Cleverley, Anderson, Antonio Valencia and Ashley Young. All of these players are painfully one dimensional and nowhere near the players they were supposed to replace. What if Sir Alex had signed James Rodriguez when he had the chance? Ezeqiel Garay? What if he had coughed up a few more million to bring Lucas Moura to Old Trafford? All these players had been very much accessible to Manchester United and were world class talents but for some reason they were never brought in. Instead, mediocrity became a regular starter at Old Trafford. Granted, all of these are what ifs, but if Man United had these players in their team right now, they would no doubt be a lot more formidable force. Lack of judgement: There have been big lacks of judgement at Old Trafford in recent years, although they have been overshadowed by the imperious Ferguson and his delivery of trophies. They let Gerard Pique leave, they let Carlos Tevez leave and they let Paul Pogba leave. Look at where those players are right now. Imagine Pique instead of Evans, Tevez instead of Hernandez or even Valencia because Tevez could play in the wings and Pogba instead of…well…any midfield player. How much more stronger would they be? It was a lack of judgment and long term vision to let these players leave. Again, these are what ifs but it would have been very easy for United to tie these players down to longer contracts but they didn’t. They put their faith in the wrong players and are now paying the price. Rocky transition after Ferguson’s departure: Sir Alex was an excellent manager. He knew his players inside out and how to get the best out of them. He was such a good manager that he managed to win trophies even with a squad that is now sitting 7th in the Premier League as defending champions, showing that Ferguson was more vital to United than any player. David Moyes is not a bad manager, but he’s no Sir Alex. Under Moyes, the mediocrity of the team is evident and he doesn’t know the players well enough like Ferguson did so he can’t win the title with this team. What Sir Alex should have done was kept Moyes as his assistant for his final year so Moyes could know his players more and have a smoother transition. Moyes should have had more sense than to replace the entire backroom staff, which had been so successful. He brought little fish to a very big pond and thus made the transition even more difficult. All this extended United’s transition and contributed to their poor performances. There is no depth in the Manchester United squad, as simple as that. At Chelsea, there is an Oscar for a Mata, a Schurrle for a Willian. At Arsenal, there is a Flamini for a Ramsey or a Rosicky for a Walcott. At Manchester United, there is nobody for a Wayne Rooney, Robin van Persie, Michael Carrick, Nemanja Vidic and even the abysmal Patrice Evra. Without depth, you can never do well because if and when players are injured, like Rooney and RvP are right now, the lack of replacements causes big problems. David Moyes has had the whole year to assess these problems. He understands football a lot more than me so he no doubt has a plan ahead regarding what should be done to improve the current United team. However, according to my opinion, this is what needs to be done. If Sir Alex had shown more foresight and better judgement to bring in better replacements for his aging and departed stars, Moyes could have had little or no work in the upcoming close season. But Ferguson didn’t and the only way out for United is to splash the cash like City and Chelsea to buy a centre-back (Garay? ), left-back (Coentrao? ), right-back (Nathaniel Clyne? ), central midfielder (Gundogan or Koke? ), and a winger (Reus?). And all of them need to be world-class. Does it seem like a bit too much? Maybe, but it’s the only way out. Easier said than done, but Man United need to get back their mojo. They need to believe in themselves and show the unity that is expected from a Manchester United squad. Maybe that will come when they win big games against rivals like City and Chelsea but to do that, they need a much better set of players. So again, it comes down to strengthening the squad. Everything points that way for Man United right now. David Moyes is not a bad manager. As his backroom staff and he gain experience, United will improve too. But Moyes needs to be given time and budget. Not to mention the support of the Old Trafford faithful. If the great Ferguson saw something in Moyes, then no doubt he is special. Everyone has to wait for him to turn things around.